Let me share the following story about my wife, Sherri. It was a weekend afternoon, and Sherri wanted to head to the department store to pick up some items. She knew that driving would be tough enough, but she felt spending time with her niece would be worth the difficulty of the trip. Sherri and her niece pulled into the store parking lot, and she drove around until she found an accessible spot near the front. Sherri pulled out her accessible placard and placed it on the back of the mirror. She then proceeded into the store with her niece to shop. Why anyone would ride one of the store scooters unless they really needed it is beyond me. Sherri’s scooter at home goes 8 miles an hour and has head lights, tail lights and a headrest. The mall carts crawl along slowly, and everyone stares at you. Sherri and her niece finished up their shopping and returned to their car. Sherri started the car and looked in the mirror and noticed a police car with its lights flashing right behind her, blocking her in. There was an immediate knock on her window. Startled, she rolled down her window and an officer stated that she was not allowed to park there, because she was not handicapped. Sherri said that the placard was hers and she handed the officer her license, her placard registration and a multiple sclerosis (MS) card. 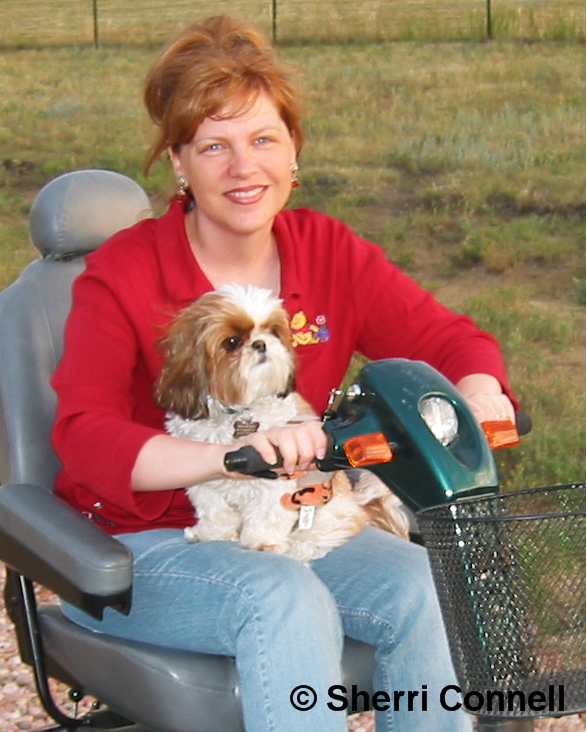 Sherri mentioned that she had the right to park there, because she was disabled with MS and had gotten approval from her doctor and the motor vehicle department. After about 10 minutes of trying to explain her disability to the officer, Sherri started to get quite frustrated. She then asked very politely for the officer’s name and badge number, and if he would please move his car. Of course, her nervous system started to work overtime and her brain went into fight or flight mode. Luckily for the officer, he said he would move his car. Then he stated, “See those people over in that Cadillac, they are not handicapped either. The conclusion of the story is that the officer was eventually reprimanded for the way he was hassling people who had the legitimate right to park in accessible parking. The general qualifications for accessible parking spaces include those using wheelchairs, walkers, crutches, canes and assist dogs. Nonetheless, most of us do not realize they also include certain impaired functions of the heart or lungs, as well as conditions which are worsened to a specified impairment by walking a certain distance. There are millions of people who are forced to contend with serious illnesses, injuries and circumstances, which have left them with mountains to climb every time they take a step. Most people do not realize a person can have hindrances on the inside, which may not be visible on the outside. Their restrictions may not be conspicuous at a glance, but their pain, limitations and inability to function normally can be debilitating. What may seem easy to you may seem like a 14,000 foot hurdle to them. Many even collapse in stores, become very dizzy and weak or even black-out. Being able to park close to the entrance of a building when they need to allows them to run an errand they otherwise would not have been able to conquer. At any rate, the purpose of accessible spaces is to assist those with many types of disabilities and health conditions. For those with various types of limitations, the spots help make it possible for them to shop or visit the doctor. How do you know who can park in an accessible space and who cannot? 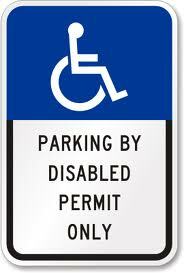 Look for a temporary or permanent placard in the front window or a disabled license plate. These items are received after an application, which is completed by a patient’s doctor, is approved by the Department of Motor Vehicles (DMV). Each state’s DMV has specific guidelines and requirements the person must meet in order to receive a placard or license plate. Most states take into consideration the impairments due to certain conditions, as well as the implications stemming from aggravations of these conditions. Therefore, if a person is issued a license and is displaying it, then they have the legal, medical right to park there. Assumption 1 – Drivers can simply request a placard from the DMV without any proof or documentation. Drivers cannot request an accessible plate or placard without a form completed by a licensed physician and with their verifiable license number. Assumption 2 – Doctors are irresponsibly filling out forms for patients. Doctors have no personal gain by doing so. Assumption 3 – Drivers are borrowing a placard from a relative. Many people believe this happens often, but do not personally know anyone doing so. At any rate, we cannot assume someone is using a placard that does not belong to them, because they do not “look” like they have a disability. If someone personally knows an individual who has stolen or borrowed a placard, they can file a complaint with the DMV. If we have further concerns with the application and qualification process, we should consider using the legislative process to address them, rather than confronting individuals in a parking lot. Chances are the person displaying a placard or plate is in fact parked legally and needs the space for physical and/or medical reasons. As you can imagine, it is difficult enough to live with such illnesses, injuries and disabilities that wreak havoc in one’s life without being harassed every time one needs to go shopping or to the doctor. Finally, if a person is displaying a license to park in an accessible parking space, try offering a hand, instead of a visual judgment. After all…the people you are graciously intending to defend may be standing right in front of you! ORDER IDA’s Pamphlet, Don’t Judge by Appearances! This article was first published on Disability.Blog by Disability.gov. October 31, 2012. I can certainly relate to this article! Many times in the past 20 years, I have felt good, walked into a department store, found no motorized carts available and because I only needed a few items, went on to find what I needed. Once, I had a paralysis suddenly, while trying to reach a bench in the pharmacy area. I was totally paralyzed, and requested that no one even try to help me to get back on my feet, because it would stress my muscles and perhaps cause permanent damage. Other times, I would get so spaced out from the exposure to multiple chemical odors, and stagger, if I did not have a motorized chair. I have had the checkout persons call an ambulance on me several times because of my being disoriented. This doesn’t happen as severe now that I am on three different medications to help manage this rare disease. Today, I felt great, walked into the store, waited more than 10 minutes for a cart to become available, and when one was, it was taken by someone else and when I spoke up that I had been waiting a long time, I was scowled at. I had to struggle to get back to my car, (not in a handicapped space, as none was available) and get my own scooter out to use. I was already weak but needed to get items from the store. I have a rare disease called Hypokalemic Periodic Paralysis, and I never know what or when a “trigger” can cause weakness, shortness of breath or paralysis. I have learned to cope. There are many others worldwide, who also have this disease that struggle also with their friends and family not recognizing that this disease is real!. I am intimately aware of this problem, being afflicted with a form of EB, epidermiasis bulosa. Not being able to walk long distances, totally determined by seasonal temperatures, my skin will blister under conditions that are totally normal for everyone else. I usually try and use regular parking when I am not experiencing difficulty, but sometimes it is hard to judge, even after having this condition my whole life. The doctor that issued my parking permit had never seen a previous case of this and had never even heard of the disability before. I totally empathize with anyone facing an ambulatory issue arising from an ‘invisible’ disability. Try and not judge unless you’ve been there yourself. Wayne, thank you for writing this! Reading about Sherri’s encounter still made me shudder. I wrote a story years ago about a similar experience (http://livingwithcfs.com/privilege-and-prejudice-disabled-parking-with-an-invisible-illness/). I so appreciate all the wonderful work you do on behalf of people with invisible disabilities…thank you! This was a great article. I too have had the police called on me, because I was able to walk into the store. No one realizes that I must instantly use a shopping cart in order to walk around in the store. I don’t bring my walker when I need to do a lot of shopping because a shopping cart holds more items. I have also had the “elderly” leave nasty notes on my car saying that I should not park there. In a doctor’s office – one of the doctors told me that I couldn’t park in a handicapped spot & I was trying to get a toddler into the office with me. No one can see the support I wear on my leg (in the winter, my pants cover it) and no one can see my heart and lung condition from the outside. I think the doctor was the one that angered me the most because a doctor should know about certain medical conditions. You are so cute! I know how you feel though I have degenerative disc disease, chiari malformation (had to have decompression “brain” surgery), and a brain tumor. All of the problems that I have are invisible to someone who doesn’t know me. I also have degenerative disc disease, L5S1 with sciatica going down the right leg, my leg weakens and have always caught myself before I’ve fallen, recently diagnosed with IT band syndrome, I have a handicap parking pass and was confronted by a man that didn’t think I needed it, of course as he was walking away, so I went up to his vehicle and asked him if he wanted to see my scars from back surgery and that my leg gives out on me, he didn’t have much to say after that, I’m guessing he won’t say anything to anyone ever again. I am so happy that I came across this website. I too have disabilities that are not always physically visible. I am in my forties, but look younger than my age. I have had so many horrible encounters with elderly people because I use handicap parking legally. I have a handicap placard and license. My most recent experience was in my doctor’s parking lot. I drove around for 30 minutes before someone vacated a handicap parking spot. When I pulled in I saw an elderly woman drive by and give me a dirty look. She drove around again staring at me and waited till I got out of my car. She said some awful things to me and when I pointed out that my handicap placard is clearly visible, she commented, oh well you know you will get a very expensive ticket for what you are doing. I was feeling bad to start with, this person who does not know me has judged me and now has made me late for my doctor’s appointment. I do not feel that I have to justify my illness to strangers. I hope the angry people that judge us are reading these comments. Thanks for sharing information about invisible disabilities! I wish more people could be informed. I am young & look healthy. On my “good” days when I am able to get out of bed I even walk upright without a hint if disability. What they don’t usually see is how the sun/heat can cause me to black out and end up covered with rashes. The cold, well it just causes me pain. I have given up shopping altogether. My husband does it now. But I still have Doctor appointments and times I have to go out. I just wish everyone could learn to treat each other with unconditional respect. Without assumptions or judgements. I am not angry and have no hatred for those people who judged me unfairly. After-all, for all I know they have their OWN disability. They must be so sad or full of hate. Or at least that’s what I tell my children…. Heck, yeah! In fact, I wouldn’t be surprised if people with respiratory illnesses, etc. aren’t at least as likely to need the disabled spaces as people who use assistive devices. I have hyperekplexia and essential vertigo from basilar migraine, and walk with forearm crutches. I have a placard I use only if I’m especially weak or unsteady, or am in a crowded or chaotic environment (triggers for days…) The rest of the time, I need all the exercise I can get! It’s entirely possible someone would see me walking in with the crutches from the back of the parking lot one day while someone who doesn’t “look disabled” used a disabled spot, and then, the next day (if it’s a Bad One for me) see me use the spot, too, while the other person was able to walk in from the back because they were having a Good Day. I wish more people could understand just how “fuzzy” disabilities can be! handicap parking permits aren’t just for people with problems walking. that is such a misconception. there are plenty of other disabilities & health problems that can affect the way people are able to move or restrict or severely limit their mobility or activity. basically, if someone meets the criteria necessary to acquire a parking permit/placard/license plate- who is anyone to judge or make that person feel bad? they have enough problems without you adding to them. just be thankful for what you have & move along!